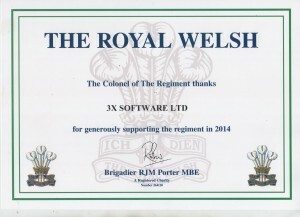 We are proud to be supporting The Royal Welsh again this year. The Royal Welsh consists of two regular battalions who are currently deployed on operational duty in Afghanistan, plus a TA battalion. Further operational deployments to Iraq and Afghanistan will include all 3 Battalions in the near future. Supporting The Royal Welsh through The Regiment Support Service helps serving and old soldiers who fall on hard times.